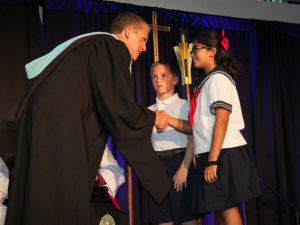 The Episcopal School of Dallas has installed David L. Baas as the third Head of School. 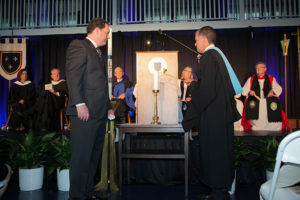 Renowned educator Vance Williams, who retired this year after serving St. Albans School as head of school for 19 years, delivered the installation address. 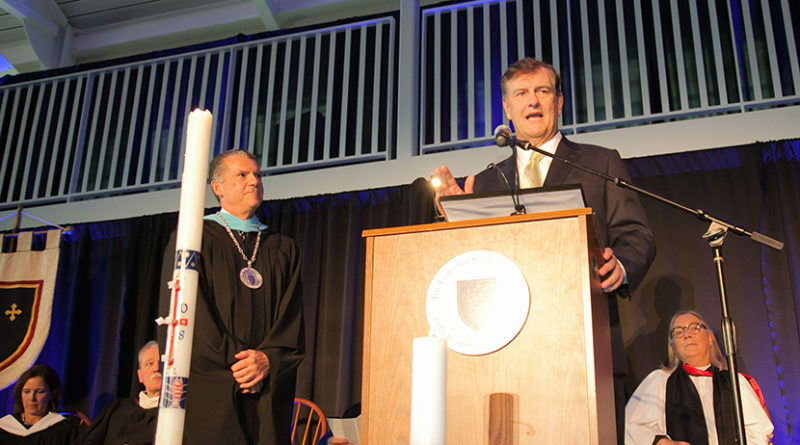 Stephen Swann, class of 1993 and son of ESD’s Founding Rector and Headmaster The Rev.Canon Stephen B. Swann, presented Baad with the Pass It On Candle, the symbol of ESD’s oldest and most powerful tradition. Father Swann, who died peacefully Monday, Sept. 17, was honored throughout the ceremony and with a moment of silence. Baad was presented several gifts to ease his transition into being an Eagle. The Lower School offered a book of advice featuring pearls of wisdom like “don’t climb up the slide,” from the Kindergarten class, and “when they say clean up, they mean everything,” from Beginners; Middle School students presented appropriate Texas attire including blue jeans, a belt buckle, and a 10-gallon hat; and Upper School students gifted a compass to always find True North. The division heads, Alumni Association, and Parents’ Association also offered special gifts. The Mayor presented Baad with a special proclamation. 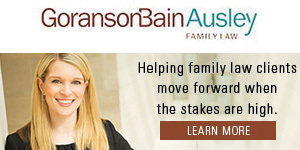 Before being named ESD’s Head of School, Baad served 28 years at St. Albans School, one of the nation’s oldest and most respected Episcopal schools located in Washington, D.C. There, he taught, coached, served as Director of Athletics and Auxiliary Programs, and Associate Head of School.